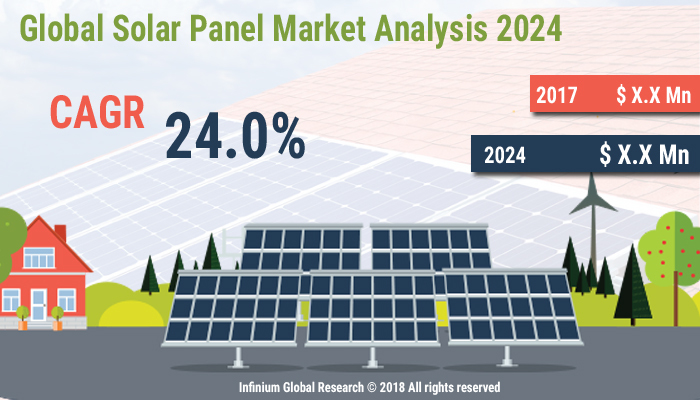 A recent report published by Infinium Global Research on solar panel market provides in-depth analysis of segments and sub-segments in the global as well as regional solar panel market. The study also highlights the impact of drivers, restraints, and macro indicators on the global and regional solar panel market over the short term as well as long term. The report is a comprehensive presentation of trends, forecast and dollar values of the global solar panel market. According to the report, the global solar panel market is projected to grow at a CAGR of 24% over the forecast period of 2018-2024. Solar energy is being progressively used in the commercial, industrial, and residential sectors. A solar panel is a panel when exposed to radiation from the sun is used to heat water or when mounted with solar cells are used to produce electricity. The solar panel has high proficiency crystalline solar cells and is easy to install and completely maintenance free. The use of solar panel reduces the amount of electricity coming from fossil fuels by supplying operations with clean, renewable energy from the sun. Solar panels utilized for residential rooftop applications but they are also widely used for applications such as powering electronic devices, individual gadgets, and vehicle batteries. Growing environmental awareness among consumers drives the adoption of cost-effective renewable forms of energy over conventional energy sources. In addition, mounting consciousness for energy security and self-sufficiency along with favorable government legislation is strengthening the solar panels market growth over the forecast period. Collective properties of solar power plants and increasing off-grid installations of PV systems for commercial and residential purposes is expected to have a positive impact on market growth. Installing solar panels on a house roof can decrease the household’s carbon footprint by an average of 35,180 pounds of carbon dioxide per year. However, climatic changes and cloudy weather can disturb the working of the solar panels. Similarly, solar technologies are expensive. These are some of the factors curtaining the growth of the solar panel market. Furthermore, government initiatives such as subsidiaries of the photovoltaic system and feed-in tariffs coupled with the expansion capacity in the Asia Pacific region and the U.S are anticipated to provide several growth opportunities for the key players in the solar panel market over the upcoming years. Among the geographies, Europe dominated the global solar panel market followed by North America. The growth of the European region is due to the favorable government initiatives and increasing awareness regarding environmental conservation. Moreover, independent responsibilities of countries such as Germany, Italy, France, UK, U.S., China, Japan, and India to the Kyoto Protocol that is designated to reduce GHG (Green House Gases)emissions, is also expected to promote market growth. Increase in the manufacturers from China and technological advancement in the solar panel is anticipated to increase the demand for high crystalline silicon photovoltaic panels. With the increase in offsite and rooftop, corporate procurement the concept of community solar panel is gaining popularity in the U.S. Therefore, the companies such as Amazon, Apple, and Target. U.S. is anticipated to be the dominant market for photovoltaic (PV) tracker systems, with NEXT rocker and Array Technologies being leading players in the U.S region. California holds the largest market share in the U.S. solar panel market. However, there is continuous growth in markets like Florida, Texas, Utah, and Minnesota. The report on global solar panel market covers segments such as type and applications. On the basis of type, the sub-markets include monocrystalline, polycrystalline, and concentrated PV cell. On the basis of applications, the sub-markets include residential, commercial, and off-grid. The report provides profiles of the companies in the market such as Yingli Solar, First Solar, SHARP CORPORATION, Suntech Power Holdings Co. Ltd., eSolar, Tata Power Solar Systems Ltd, Gintech Energy Corp, Bright source Energy Inc., and Kaneka Corp. The report provides deep insights into the demand forecasts, market trends, and micro and macro indicators. In addition, this report provides insights into the factors that are driving and restraining the growth in this market. Moreover, The IGR-Growth Matrix analysis given in the report brings an insight into the investment areas that existing or new market players can consider. The report provides insights into the market using analytical tools such as Porter's five forces analysis and DRO analysis of the solar panel market. Moreover, the study highlights current market trends and provides forecast from 2018-2024. We also have highlighted future trends in the market that will affect the demand during the forecast period. Moreover, the competitive analysis given in each regional market brings an insight into the market share of the leading players.